The magazine for horse people…. We Ride Sport and Trail Magazine. We Ride Sport and Trail Magazine is committed to promoting riding associations throughout the U.S. It is a great publication for those searching new riding opportunities, equine sports and events. Each issue covers a variety of associations sharing information which may be of interest to members, potential members, or people who simply enjoy reading about what’s going on in the equine world. We Ride Sport and Trail Magazine also covers an equine charity or non-profit in each issue, to help promote and generate awareness of organizations who help horses, people who benefit from equine therapies (who doesn’t?!) and those who may be searching for an organization to support. In addition to equine associations and non-profits, We Ride Sport and Trail Magazine also presents completely original feature articles by gifted trainers, horseman Jeff Wilson and Parelli Professional Nancy Slater, and often re-publish stories from some of our nation’s most knowledgeable equestrians. 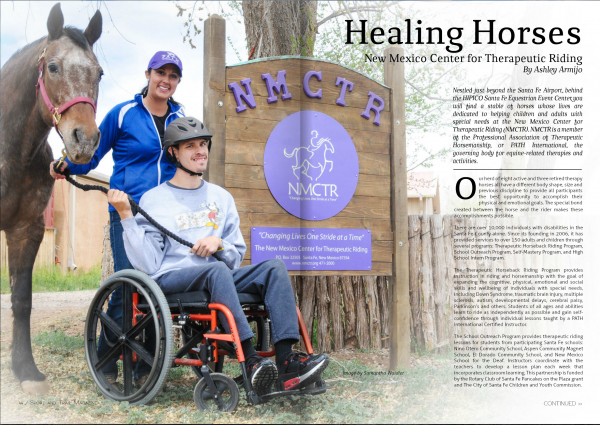 Check out the March 2019 issue as NMCTR was featured as the monthly non-profit! View the March issue HERE!